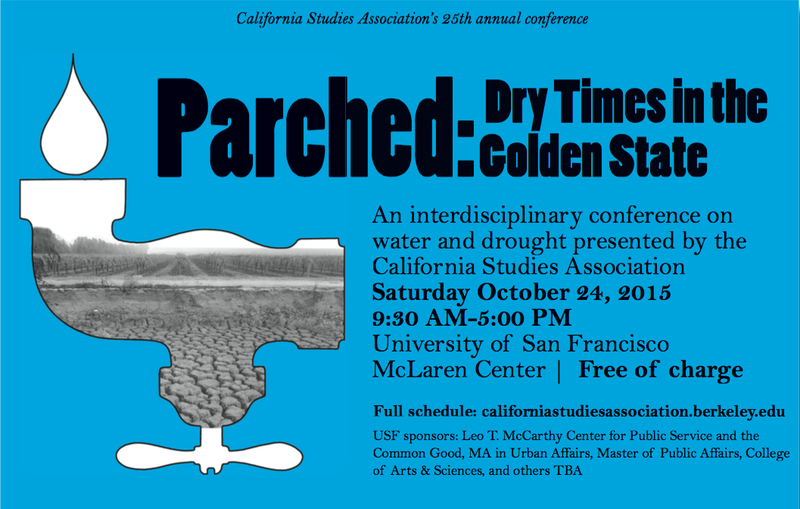 Parched: Dry Times in the Golden State — Oct 24!! Join us next weekend — Oct 24 — for a day of conversation and exploration into drought, water, policy, history, race, art and more! We’ll be at the University of San Francisco all day long and we hope to see you! Kim Bancroft will discuss her recent book which is both a biography and oral history of Malcolm Margolin. Malcolm will attend as well, just to make sure the discussion stays on track. Kim is a teacher, writer, and editor whose publications include an edited version of the autobiography of her great great grandfather, Hubert Howe Bancroft. Malcolm has recently announced his pending retirement from Heyday Books, the remarkable institution he founded more than 40 years ago. The session will be held on Tuesday, November 10 from 7 to 9:15 p.m. at the UCB Institute for Research on Labor and Employment, 2521 Channing Way (just east of Telegraph Ave.). Free dinner. Contact Margaret Olney at margaret_olney@berkeley.edu, 510-643-8140.